If I come up against some kind of challenge, task or obstacle, my first thought is usually “what could I utilise to make this easier?” I find a spoonful of technology makes the world go round, or some other confusing kind of mixed metaphor, but the principle works. If you want to paint a room, use one of those self-cleaning even-distributing electronic paint pods, rather than getting more paint on yourself and your carpet using the traditional tray-and-roller method. If you need information on the move use your data-enabled smartphone, rather than scouting around for an internet cafe, paying £3 an hour and feeling obliged to drink stale filter for the duration. If you’re booking a holiday use the web to find the best price and comparison sites to get real reviews on the destination and hotel, rather than trusting to travel agents who are basically obsolete in this digital age (and will tell you anything to make a sale given the massive amount of business they have lost to the web). What can you use, though, if the challenge is one of pure physical endurance and stamina? How can technology help if the task is simply you, 26.2 miles, and a whole lot of pavement? 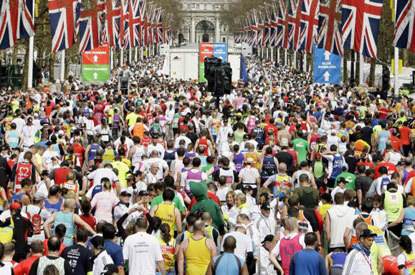 I’m running the London Marathon to raise money for Cancer Research UK (you can sponsor me by visiting my JustGiving page), but what technology can you utilise to help you get around a marathon? I will be in there (somewhere) come April 25th this year.